We’d love your help. Let us know what’s wrong with this preview of The Stoic Art of Living by Tom Morris. Tom Morris's exuberant seminars and presentations to business leaders have taken the commanding heights of corporate America by storm and his books on philosophy for businesspeople have sold millions. Dr. Morris shows how the ideas of Stoic Philosophy - which emphasizes goals like gaining command of one's passions and achieving indifference to pain and distress - are compl Tom Morris's exuberant seminars and presentations to business leaders have taken the commanding heights of corporate America by storm and his books on philosophy for businesspeople have sold millions. Dr. Morris shows how the ideas of Stoic Philosophy - which emphasizes goals like gaining command of one's passions and achieving indifference to pain and distress - are completely up-to-date in their relevance to the practical issues people confront in the 21st century. To ask other readers questions about The Stoic Art of Living, please sign up. Life changing and perspective altering. I used to be an avid reader and this was an excellent choice to get back into it. This might be the best book I have ever read. The only thing that is good in and of itself lies in the will, your willpower. Anything that happens that is outside the realm of your own will is out of your control and is thus neither necessarily good, or bad. Regardless, feels good to finish an entire book. Looking at the title, you may have trouble figuring out whether to classify this in "philosophy" or "self-help". It's self-help. That's not a knock against the book, but that's what it is. The book's style is as follows. Many short chapters are divided into three sections, with each section corresponding to a Stoic thinker: Seneca, Epictetus, and Marcus Aurelius. Each chapter has a theme (e.g. : "Clarity for the Journey", "Obstacles and Anger", etc. ), and in each Morris quotes the Stoic and then o Looking at the title, you may have trouble figuring out whether to classify this in "philosophy" or "self-help". It's self-help. That's not a knock against the book, but that's what it is. The book's style is as follows. Many short chapters are divided into three sections, with each section corresponding to a Stoic thinker: Seneca, Epictetus, and Marcus Aurelius. Each chapter has a theme (e.g. : "Clarity for the Journey", "Obstacles and Anger", etc. ), and in each Morris quotes the Stoic and then offers commentary on the quotation. There are enough quotations here so that even if you end up hating Morris' commentary, you'll at least get a compendium of inspiring Stoic maxims. I had thought that this was going to be a book about philosophy and, specifically, the Stoics. Instead, it was a self-help book with cherry-picked quotes from three Stoic philosophers used to back up otherwise unsupported opinions. And it read like an essay I might have written in high school - sort of like a very slightly more mature version of Who Moved My Cheese? And I guess I could have been OK with that had it been done well or with some modicum of insight. Instead, the advice came across li I had thought that this was going to be a book about philosophy and, specifically, the Stoics. Instead, it was a self-help book with cherry-picked quotes from three Stoic philosophers used to back up otherwise unsupported opinions. And it read like an essay I might have written in high school - sort of like a very slightly more mature version of Who Moved My Cheese? 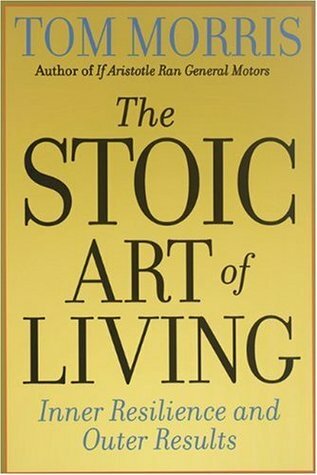 A self-help type instruction manual in Stoic philosophy, my only complaint is that it is too "dumbed-down" for my taste. Heck, Morris doesn't even cite his sources in the original languages! But I found it to be a user-friendly introduction to the philosophy. I last read this book on 12/2/13. Still good.